Perhaps no physicist has come closer to becoming the ultimate politician as Albert Einstein, when he was asked to become the second president of Israel in 1952. He declined of course, but decades later more and more scientists are plunging into the political scene. A suspicious public, misleading media coverage, and lack of public debate has caused a growing number of scientists to advocate for "evidence-based decision making" in public policy, rather than the influence of popular emotion or intuitive appeal. 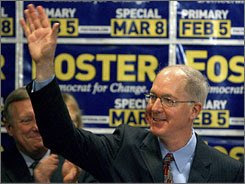 Democrat and physicist Bill Foster (pictured), who recently replaced Dennis Hastert as House Speaker in March 2008, says that evidence-based based decision making has been unfairly criticized and portrayed in a negative light. This past weekend, over 70 scientists and engineers gathered at Georgetown University in Washington, DC for a workshop on how to get elected to public office. The event was held by Scientists and Engineers for America (SEA). Among the attendees was Daniel Suson, who has a doctorate in astrophysics and has worked on the superconducting super collider and a forthcoming NASA probe. Now his sights are set on running for elective office, and he worries this task could be more challenging than physics.